I'm using Carrara 5, and messing around with the plant generator. It doesn't seem as though the "Generation Count" value is doing what I think it's supposed to though. I thought every time I increased this value, an additional level of branches would be added on. Am I misunderstanding what it does or using it wrong? I have set "Tree Generator" to Hybrid. If I set Generation Count to 0,1, or 2 it works as expected. However when I set it to 3, instead of adding another level of branches, it just rotates one of the branches added by level 2 sideways. If I set it to any value higher than 3, nothing happens. talking through my hat here but are you checking in the assembly room by rendering to see if there are changes happening in the tree or just checking in the plant "modeller"? Rendering doesn't appear to help, it still has that same shape it had in the preview. Sorry Sean, I'm no help then as I don't have c5 on my machine anymore. 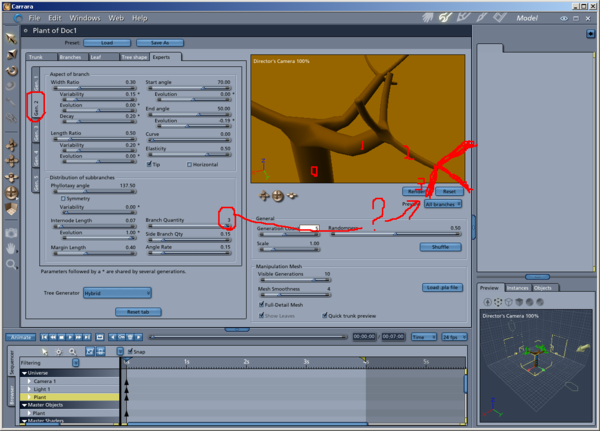 I don't have C5 either anymore, but in C7 and C8 under the Tree Shape tab, there are also some values that has to/can be adjusted for the way the branches are generated and distributed. If you look to the left of the big screen shot you'll notice tabs that Gen 1, Gen 2, etc. Try making changes in Gen 3 as well. I also noticed that your evolution sliders are set to 0 and the one under Internode Length in the, Distribution of Sub-branches section is a negative number. In the same section there's a Branch Quantity slider set to 2. Try increasing to see what happens. There's also other tabs in the editor besides Experts that will effect the tree. It would be helpful to see screen shots of the Branches tab and maybe the Tree Shape tab. There's also nothing wrong with opening a couple of the included trees to see how they were made. I made a pretty nice Weeping Willow by starting with the included Burr Oak tree in the Objects Browser. Don't get me wrong, it took time, but it was possible. I didn't even notice the "Gen 1" through "Gen 5" tabs on the left, and misunderstood where the branch count was coming from. So the first 5 generations can have some parameters differ, that's handy. 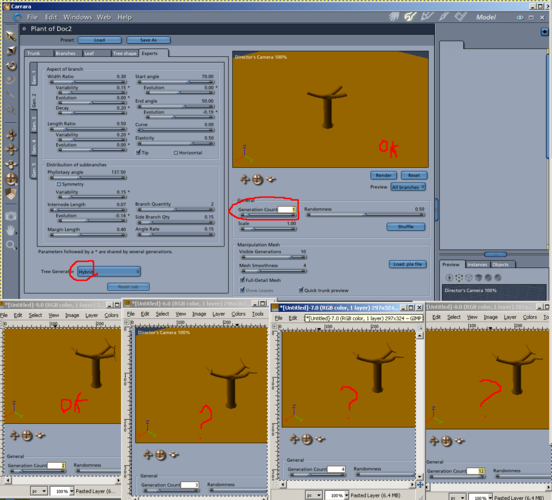 Ok, so I went to the "Gen 1" tab and set the "Branch Quantity" parameter to 3. Since the trunk is generation zero, it appears that this parameter is the number of generation 2 branches extending from each generation 1 branch, that makes sense. I then went to the "Gen 2" tab and set that "Branch Quantity" parameter to 3 also, expecting to see three generation 3 branches appear. However, there are still no generation 3 branches, even though I have General > "Generation Count" set to 5. I tried playing with some of the other parameters, but didn't seem to find anything that would indicate why this is, so I assume I'm still misunderstanding something. I've attached two more screenshots from a different test. Try unchecking the quick trunk preview, maybe that will help? Also, try looking doing a test render to see if they show in a render. I would also reiterate, that there's no harm in looking at the settings of one or two of the included trees to see how they were done. It may give you some ideas and jumping off points. Unchecking the quick trunk preview didn't do it, and the test render shows the same thing, so they aren't just being hidden in the preview. I tried Basic Plants > Silver Maple (a hybrid) from the object browser. (looks like for at least one other tree I selected, that slider wasn't enabled.) I'm still not seeing exactly what that parameter is doing; I'm sure it will make a lot of sense later someday when it all clicks. I tried fiddling around with a bunch of the sliders quickly to see what affect each had until I got an error, then called it a night. I'll give it another shot later and look at some different trees instead. If you want to use an "Hybrid" with lot of "Generations", then load the preset "Silver Maple". That will allow you to add/edit an higher generation count. Be cautious if using a main trunk with 3 branch quantity, as if then adding 5 or 6 generations, it can start to take Gigabytes of memory. 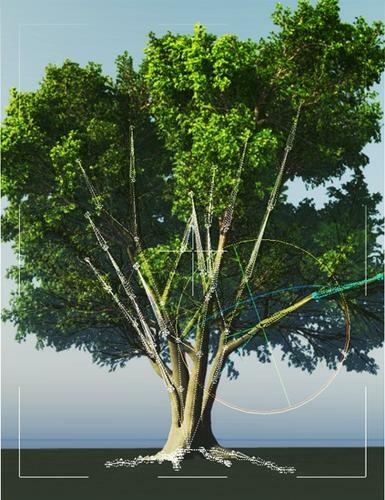 The Trunk tab 'Branch Quantity' slider is counted as 1 generation(afaik) in both the Tree Shape tab->Ramified Thrsld. and General->Generation Count sliders(Carrara 8.5 Pro beta 204). Having spent countless hours with the Carrara plant generator in past years, I think you have to reconcile the fact that the interface promises much more functionality than is actually there. Don't waste time searching for the perfect combination of settings that will give you the exact trees or plants you're looking for, they don't exist. It can generate some acceptable very basic trees and plants, but don't expect more. I wasn't expecting fantastic trees from it, they definitely appear to be geared more towards background use and not closeups. I actually have a pretty hefty plant library anyway. However I was actually hoping to be able to control the trunk and branch shape to produce more specific and unusual shapes than what I have been able to do so far. Being able to understand what the various parameters actually do would help. That's what I'm trying to tell you. You won't be able to control the trunk and produce more specific and interesting and unusual shapes. The parameters have little effect outside of length and a little twisting. The interface makes it seem like you can do all sorts of things that it doesn't really do. I spent massive amounts of time trying to do what you are trying to do. I eventually starting designing systems which used replicators and nodes and made complex trees out of many regular trees. I'm just trying to save you the time. You'll never get anything much different from what you already have out of the tree generator. Problem was most people didn't have enough ram to use these. Kind of like some of Howie's scenes, looks good - but too much computer power needed for most. Probably more feasible now, but I barely have time for anything outside of my work. Good to know, thanks for the heads-up. on Howie's scenes, one thing you can do, I have done, is swap out the trees in the replicators with other versions or objects ie lowpoly tree models. not tried one in a Howie scene yet though, just Poser and iClone but should work. lol! I clothified one in Poser to create Autumn fall but it crashed Poser!